I have some very big news for you today. 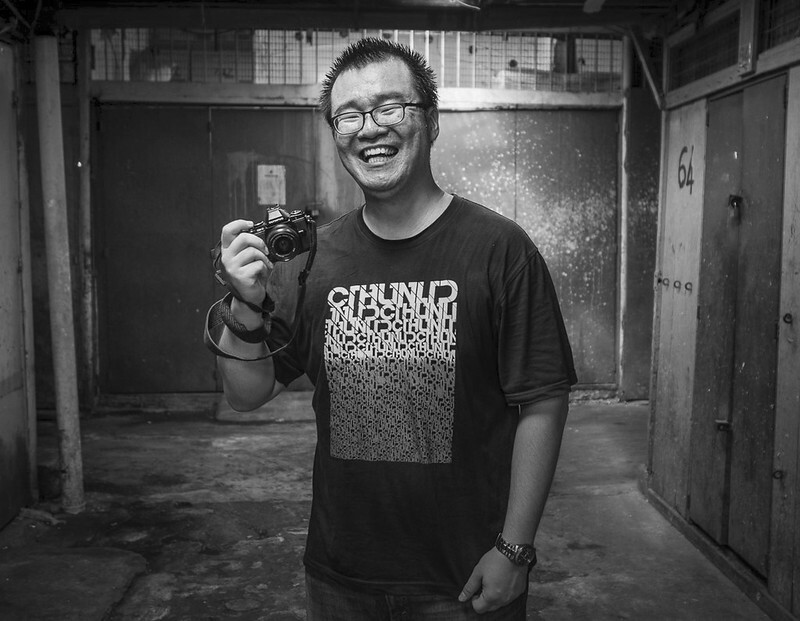 Robin Wong – M4/3 expert, street shooter, fellow Malaysian and all round nice guy – will be joining the site as a contributor. I believe our strengths and coverage are complimentary but not really overlapping, which means extended coverage and a different perspective for our loyal readers, and yes, including new product reviews (which is something that I of course cannot do in my current position). Robin is somebody I’ve always enjoyed a strong relationship with and wanted to collaborate with, though this would of course have been problematic whilst he worked for Olympus. Thus for purely selfish reasons, I was quite happy with the news of his going independent. Having done the same thing myself more than five years ago now, and under quite different – and ironically, easier – professional photography market circumstances, I’m glad to he sees enough potential to make the jump and happy to be able to support him. In the coming weeks you’ll see of course new content from him, and a reshuffling of the site to accommodate an archive for his work. Robin’s existing site will of course continue on as an archive of previous work. This makes a great site even better. The timing couldn’t be better for me. I recently purchased an Olympus camera and a few lenses. I’ve gone back and read some of your old reviews from Shutter Therapy. Great stuff. Like Ming your reviews have some beautiful images. I’m really enjoying the added content and look forward to more of it. Thank you! Congratulations to both gentlemen! A two-man army is born, and I for one can’t wait to see the resulting eye-candy. Ming of course is a Titan in his own right, and I have always absolutely adored Robin’s spontaneous, honest and inspired work. I love you Robin! Welcome! Congratulations to both of you! I regularly read both websites and think both of you are gifted photographers. A good match. Beyond my abilities, I’m afraid! I haven’t visited in a while but I am glad to see two people I regard very highly collaborating in this new venture. May the light and the world favor you. That looks like the standard neck strap wound around a few times. Hey Mike, that was a cheap neck strap that I bought off a discount bin! Yes, wrapped around my wrist a few times, because I was sweating profusely from the walk under cruel Malaysian sun. Great! You, Robin and Eric Kim are my go-to blog guys………. If you find hard enough you will see a video of me and Eric together on Youtube, but that happened many years ago. Are we going to see a friendly shootout, MF 100MP against M4/3 ? Good news ! It is fantastic to read Robin and Ming together. Greetings from Italy. Buona fortuna per la vostra esperienza insieme. Please pardon my ignorance – until yesterday I did not even know you existed. After looking at your website I think you and Ming have made a good decision. I am looking forward to your work with Ming. After having been a “Nikon-only” person for several years, I bought an E-M1.2 and a few Zuiko-lenses to go with very recently . . .
Wow, this is fantastic news! I’m so delighted for both Ming and Robin…two of the most inspiring, genuine, thoughtful, and intelligent artists and photography mentors on the web. But more importantly, I’m delighted for all of us readers. This is a huge win-win and I’m looking forward to the continued evolution of this website and of both Ming’s and Robin’s bodies of work. Thanks to both of you for your continued service to our global photography community! Two of the most interesting photography thinkers and writers, so very different in style and approach. Excellent! I hope it works well for you both. I have followed you both for a few years now! Always interesting……….Must be something in the air in KL…! This is a brave statement . . . I am so happy for both of, here in the states I follow both of constantly, and enjoy both of your work and insight. Bravo! PS: any update on the drone and whether (either of) you find it a useful complement to “normal” cameras? Drone: yes, it’s useful especially as a scouting tool, but also when you want an interestingly abstract vertical perspective…more to come. Hai Robin. Glad to see you here. I am fan of your blog. Can’t wait to read more great articles here from both of you. Welcome. Hey Kalai, glad to have caught up with you recent! Do stay around we have interesting stuff lining up! An announcement awaited for weeks, and a very welcome one. One plus one should equal way more than two in this case. Somehow a few people managed to put the pieces together! Glad to hear Robin joining forces. Two distinctive style, one plus one more than two ! Thanks Sim! See you this Saturday! Good luck Robin and have fun. Congratulations to both of you. Robin, I know you got some flak when you became an Olympus employee although I thought you kept your objectivity. I think this will be a great partnership with complementary approaches. Thanks John! Now that I’m not with Olympus I am free to do pretty much anything without restrictions! Kind of like Superman and Batman joining forces. Great news and I look forward to your collaboration and all the great articles that will surely come. Haha, now I have to ask who’s who in this duo! Strangely I’m more interested being a villain! Can u be a Luthor? This is indeed very good news. I follow him and his exceptional photos. Genius! I have been a Robin Wong fan since I picked up an Olympus about 5 years ago, and I will follow him wherever he goes … and I am pleased with the new path Robin has taken! Congrats on the collaboration, Robin and Ming! I’m following both of you. Your work was, is and will be inspire my own way of photography. That you join together will gain more in the future, thanks for sharing and keep on going. It’s great to have more contents and product reviews. Welcome aboard Mr. Robin Wong! A big thumbs-up for this smart move to both of you! Thanks for diversifying and enriching this site – not that it was lacking anything, but it’s a good thing nonetheless, not the least because it also means sharing the burden, thus profiting all sides. I’m quite taken by what Robin has shown and written in the past and am looking forward to his contributions. A cumulation of the best boosts this already excellent site to even higher levels. Congrats. I like Robin’s cordial style and Ming’s perfection. It can not get better than this. Looking forward reading your posts. Welcome Robin, you’ll fit right in here. Outstanding news! Really looking forward to this synergy! Welcome and congratulations! A great addition to a fantastic website. Welcome Robin! Looking forward to see the fruits of this collaboration. Wow, great news, welcome Robin! Welcome ! Robin, your partnering with a great man. I will look forward to hearing from you . I have always wondered if you have ever crossed paths. Looking forward to this. Very good news. Ming was the advisor which made me more aware of the technical and inspirational side of fotography, and Robin always captivated me with his enthusiasm and good and colorful images (he still uses Olympus Viewer for RAW? It always baffled me 🙂 ). As Ming said, two very opposed points of view, but with a convergence: good images is what matters. Best wishes for both. For olynpus specific reviews I will still use Olympus Viewer 3 to deal with the RAW files. For everything else I believe there are better and more efficient tools out there! Well done Ming! A big step having a new partner onboard, but seems as if Robin has the writing and editorial chops to be a meaningful foil to yourself. Very exciting news! My favorite photographers/bloggers now on 1 site consolidating my morning reading. Best of luck Robin! Spectacular development in the photoblog world. May your hit-rates be plentiful! This makes perfect sense as M43 is certainly no threat to Medium Format. Full Frame however, may be a reach here. Will you guys be putting an A9 on the bench to kick things off? Perhaps the D810 successor? I’ve been reading RW’s stuff since I bougt an OLY Pen-F and got to love a small sensor. I’m not always in agreement with Robin. But who couldn’t like a guy with a smile like that? Awwww… Thanks for the kind words. And thanks for sticking around! That was a nice surprise, this morning. First Robins post on his blogspot showed up in my RSS-reader, immediately followed by this one. Two of my favorite photo bloggers now working together. Wishing you both a long and fruitful cooperation together. I expect it’s going to be awesome! We hope so too 🙂 Thanks! Congratulations both, and welcome Robin! Great news from asia! I check both sites regularly and am very fond of the m4/3 system. Warm welcome to Robin! Looking forward to read from you! Yes,the dynamic Duo, Batman & Robin :o) looking forward to reading contributions from both of you. As I wrote in RW blog: Yeah! I like you both! That’s fantastic news! I enjoyed reading Robin’s views, great to see you guys combining your various strengths. Best of luck together! Thanks bartjeej! Can’t wait to start writing here. Welcome Robin! Meeting Ming’s high-standards for gear reviews most certainly won’t be a walk in the park! Best of luck! Thanks Egmont, as Ming Thein mentioned, integrity is important. While we both have differering review styles, that actually is what will make this work, there is no point duplicating each other’s style! Gaining from strength to strength at mingthein.com. I’m happy for you, MT. Welcome, Robin!! Wesley, we should catch up soon! Coffee some time would be awesome. Hmmm, I knew things were changing for Robin but I am somehow sad to hear that his website will no longer be updated? I see two very different styles between Ming and Robin; I hope they can co-exist under one roof. Time will tell if Robin keeps to his roots or becomes part of a machine that will make him change. Robin, your strength in is being perceptive and seeing the action at street level, less clinical but instilling a stronger human element in your images. That was precisely the reason for the collaboration: we do things differently. Any other way and it wouldn’t make sense – why would you or I want a clone? Thanks for staying with me all this time, and rest assured, my style in photography and writing will remain the same. I am only writing and sharing on a different platform, that’s all! Party on guys! So does it mean I can’t go shooting with Robin anymore? Hahaha! He is now atas! You are always welcome to join my shutter therapy session. Bring along Ripi and some other kaki too. You may reach me through my FB messenger. Truly, 2 of my favorite photographers!!!! Excellent! Welcome and good luck Robin!!!! Thanks Thomas! Shall do my best. Brilliant–I am a big fan of Robin’s and have been following his blog since the pre-Olympus days. I don’t really see any overlap issues at all. Looking forward to his contributions. Yay! Welcome Robin! Ming could not have picked a nicer and skilled collaborator! Thanks Andre! You are too kind with words.